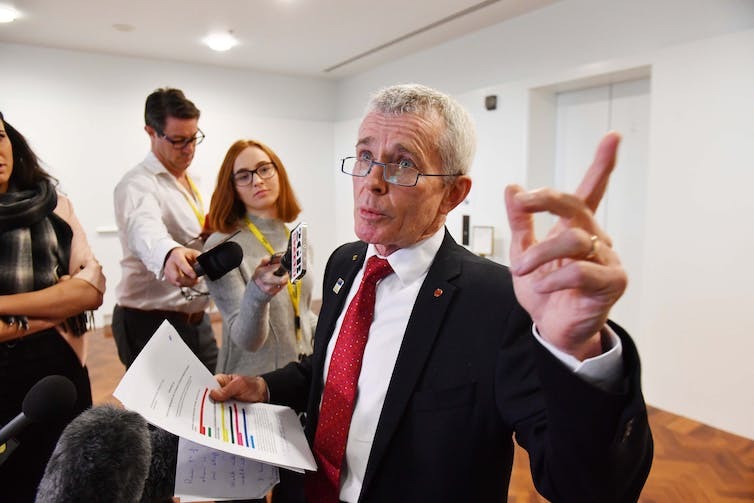 Malcolm Roberts is one of several MPs currently before the High Court. The High Court has rejected the government’s request to have MPs’ dual citizenship cases heard in mid-September, instead setting hearing dates of October 10, 11 and 12. This prolongs the uncertainty for the government, which has the eligibility of two Nationals ministers – Barnaby Joyce and Fiona Nash – and former minister Matt Canavan under consideration. Labor has made it clear it will continue to challenge the presence on the frontbench of Joyce and Nash. Opposition Leader Bill Shorten on Thursday repeated his call for the two to stand down from the ministry. “It is an untenable, unsustainable situation for government ministers with a cloud over their eligibility to sit in their portfolios, making decisions.” Shorten said if it were “subsequently found out they weren’t eligible to sit in the parliament, the decisions they made can be appealed”. The court currently has five current and former MPs before it – apart from Joyce and Canavan, they are two former Greens senators, Scott Ludlam and Larissa Waters, and One Nation’s Malcolm Roberts. Nash and crossbench senator Nick Xenophon will be referred to it when parliament resumes early next month. Canavan’s lawyer revealed Canavan was an Italian citizen by descent since he was two years old, due to a change in Italian law at that time that enabled citizenship to be passed down through a person’s mother, not just their father. This means that Canavan already had citizenship when his mother – of Italian descent but born in Australia – obtained it for him when he was an adult. He has said he only became aware she had signed him up after the citizenship issue blew up. Solicitor-General Stephen Donaghue told the court the eligibility of Canavan, Joyce and Waters should be upheld, because they had not known they were dual citizens. In contrast, Ludlam and Roberts had in the past filled out forms acknowledging they were citizens of other countries. Ludlam should be disqualified, Donaghue said, while Roberts’ situation turns on the timing of his renunciation form. Roberts’ barrister said he needed more time before the case was heard. The court has given standing in the case to Tony Windsor, who ran unsuccessfully against Joyce in New England at the last election. Windsor held the seat as an independent until retiring at the 2013 election. He has not ruled out contesting if Joyce were declared ineligible and there was a byelection. Windsor’s lawyer argued in court that Section 44 (i) of the Constitution was clear, and it was the candidate’s responsibility to check whether they were a dual citizen. Prime Minister Malcolm Turnbull repeated on Thursday that: “We are very, very confident that our members who have been caught up in this will be held by the court to be eligible to sit in the parliament”.